Romania, Slovenia and also Denmark. Those three countries have before used the backing singers who will join Anja on stage in Kyiv, Ukraine. With less than two week’s until the Eurovision rehearsals starts, Denmark today presented its team of backing singers. 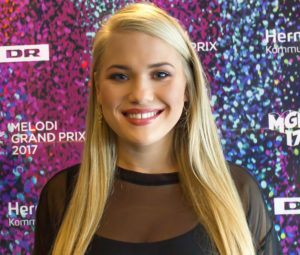 This afternoon, Danish broadcaster DR revealed the five backing singers who will support Anja on the Eurovision stage in Kyiv. It is five well known backing singers, three of them with previous Eurovision experience. Linda Andrews won X-Factor in 2009. She is of Faroese background, and is now working on her sixth album. In 2013, she was backing singer for Slovenia at the Eurovision Song Contest. The song Straight Into Love was performed by Hannah Mancini, and finished 16th in the semi-final. Julie Lindell was backing singer for Romania’s Paula Seling & Ovi at Eurovision in 2014. Their song Miracle came second in the semi-final, and 12th in the final. Julie has also toured with Will Young, and is regular backing singer for Danish Anne Linnet. Andy Roda took part in the Danish final in 2015. But he has been to Eurovision before as in 2014, he was backing singer for Basim. Cliché Love Song was Denmark’s entry on homefield and finished in a 9th place. Trille Palsgaard was one third of the group Me, She and Her which had a massive hit in 1995 with the song I Count The Minutes. She is now active as backing singer and song coach for among others Denmark’s superstar Lukas Graham. Jasmin Gabay is a trained vocal coach. She has sung a lot of gospel, jazz, bigband, but also rock, so she is quite versatile. Anja’s entry for the 2017 Eurovision Song Contest is titled Where I Am, and you can see it below in a video from Amsterdam a few weeks ago.